Ahhhh Icing. Isn’t that what is on the cake? What is icing in hockey? One of the more interesting rules and a fun one to explain to anyone that is new to Ice Hockey. So, what is Icing? When did start? Is Youth Hockey different than the NHL? All great questions! The icing rule was entered in the rule book in 1937 as the result of many games and a few in particular when a team with the lead would “ice” the puck. This was extraordinary in a game on November 18, 1931 when the New York Americans protected a 3-2 lead over the Bruins by icing the puck over 50 times. The teams met later that year and the Bruins iced the puck 87 times in a scoreless draw. Fans were furious!!! This rule was put in place to make the game more interesting. The league and fans agreed that paying to watch professionals play to just ice the puck, will not be tolerated. So, does icing work the same way in youth hockey? Yes and no. The rule above was slightly modified last year. If a team has fewer players (shorthanded) than the opposing team the icing rule is enforced. USA Hockey modified this rule last year for players 14U and younger. It is no longer legal to ice the puck when a team is shorthanded. Wow! That is a big change to the penalty kill. USA hockey has a reason for this. There is, was, and will be great debate about this change. USA hockey reason is quite good. Do we want to see younger players just dump the puck? 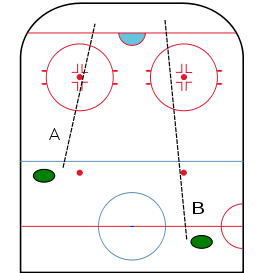 Ice time is valuable and to have players dump the puck is not worth it. I’ve grown to like the rule more each week. The icing rule makes teams pay the price more for penalties. It would be interesting, and let the debate begin if this rule should be changed in levels above 14U? Juniors, International, AHL, or the NHL! Fans pay big money to watch hockey. Do we want to see the puck dumped in the zone? It would also be a larger consequence of penalties.